FaxTools eXPert is the benchmark in fax communication software. Discover the convenience of sending and receiving high-quality faxes directly from your PC. FaxTools eXPert provides you with choice of faxing over the Internet (FoIP) or through more than 1,000 supported modems. The software integrates seamlessly with MS Outlook and Outlook Express. It allows one-click image acquisition from a scanner, graphic design of cover pages and multiple types of attachments. Save up to 40% on all your long distancefaxes. Send high-speed digital quality faxes over the Internet using your existing cable or DSL Internet connection. A fax service is required to take advantage of this feature. See our partner Venali for details on how to subscribe. Standard Fax - Send and receive faxes using your modem. FaxTools eXPert works straight out of the box, and supports over 900 modems. No complex configurations or setup procedures are required. Plus FaxTools eXPert will allow you to customize, annotate, scan your faxed documents and more. Send your fax broadcasts directly from Microsoft Word using the mail merge feature and use the deferred sending method to save money by sending your faxes during off peak hours. Send faxes from any Microsoft Office Application such as Word and Excel. Fax paper documents from your scanner. Acquire the scanner image in a single click and modify the quality of the scanned image. Do you want to make changes to a fax you just received? 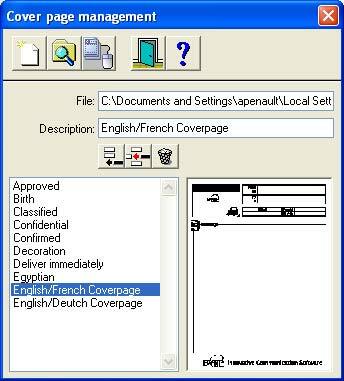 FaxTools eXPert allows you to directly annotate your received fax messages. Modify them in your word processing software, thanks to the integrated OCR feature. Never miss a fax - Program FaxTools eXPert to automatically forward faxes received during your absence to an email account or to a fax machine and view them at your leisure. FaxTools eXPert can send and receive your faxes over the Internet (FoIP) or through a classic modem. You have complete integration with MS Outlook to manage your contacts. 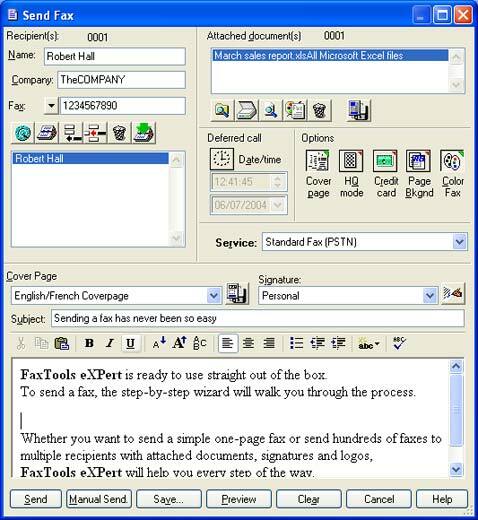 FaxTools eXPert is simple to install, easy to operate, and works with any modem. Includes a step-by-step wizard that walks you through the process. You can send a simple one-page fax or hundreds of faxes to multiple recipients with attached documents, signatures and logos. Save up to 40% on long distance charges by faxng your documents through the Internet. Send faxes to multiple recipients simultaneously. Avoid the need to have a dedicated fax line. Receive faxes even if you are not online. Receive faxes in your email client, and send attachments, just as you do with email. These features require an Internet fax provider such as Venali, our FoIP partner provider.